Kia Motors has introduced its new environmental brand ‘Eco Dynamics' and an LPI Hybrid based on its Korean market Forte saloon as part of its commitment to the development of earth-positive vehicles. The Eco Dynamics brand was unveiled at Kia Motors' domestic sales headquarters in Apkujeong-dong, Seoul, along with the company's blueprint for developing low-emission, fuel-efficient vehicles. The new brand communicates Kia's unique strategy and vision for vehicles with a reduced environmental footprint. It reflects the determination of the Hyundai-Kia Automotive Group to propel Korea into the ranks of the world's four leading producers of green cars by expanding investments into eco-friendly vehicles and R&D. The announcement of the green label also signifies the adoption of environmental management as a new growth strategy for Kia. Vehicles with new, environmental technologies including hybrid vehicles, plug-in hybrid vehicles and hydrogen fuel cell vehicles will be identified with the unique Eco Dynamics badge. Kia has already showcased the c'eed ISG model year in Europe. The ISG (Idle Stop and Go) features an auto start-stop system for enhanced fuel efficiency and is a first for a Korean car. 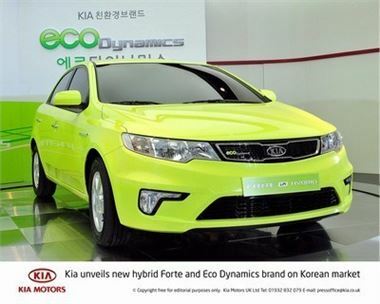 Kia will unveil its first hybrid vehicle, the Forte LPI hybrid, on the Korean domestic market this August. Kia plans to introduce a mid-sized, full hybrid vehicle in 2011 and follow up with early commercialisation of a hydrogen fuel cell vehicle in 2012. The Forte LPI hybrid car runs on both Liquefied Petroleum Gas - a popular fuel in Korea - and electricity. It employs a hybrid system which supports the internal combustion engine during motor starts and acceleration. Equipped with a 1,600cc Gamma LPI HEV engine, the Forte LPI hybrid boasts maximum power of 114ps and maximum torque of 15.1kg.m. It offers drivers unrivalled savings with a fuel efficiency of 17.2km/litre with a CVT transmission. When converted to a standard petrol engine that figure would be 21.5km/litre. The Forte LPI hybrid is also the first car in the world to use lithium polymer batteries. Compared to nickel-metal-hydride (Ni-MH) batteries used by competitors, lithium polymer batteries provide more power in a lighter and compact package, enhancing fuel performance and freeing up more space. The car will be shown to general public at the Seoul Motor Show 2009 that opens on April 2.